Is today’s swine flu an echo of the savage Spanish flu that struck the world in 1918? That fall, as our troops returned from WW1, they brought home a silent killer that would afflict one in six Canadians, killing 30,000-50,000 during the winter of 1918. Such pandemics had visited before. In 1889-90 flu affected 40% of the globe. The Spanish flu hit Canada Sept 9, killing 9 American soldiers in Quebec City. On the same day 400 students in a Quebec College fell ill. By Oct 9, Brantford Ontario reported 2,500,cases. The flu then raged across the prairies. As the troop trains headed west, during that dreadful October, soldiers brought home the disease to their towns, villages and farms. Tens of thousands fell ill. By early October as the death toll mounted communities started to ban public gatherings. Schools, colleges, and universities closed. Across the country most church bells did not ring on Sundays. But Father Trasiuk of Hamilton’s Stanislaus Church, had defied the ban, and was fined $25. In Calgary they ran out of coffins. And in many rural areas, with no time to bury the dead, corpses were placed on the roofs of their owners’ log cabins, out of reach of animals till spring. After years at the front, returning soldiers could not embrace their loved ones. Anxious wives would meet husbands at the station unable to touch them, or even get near. One, who did, died, shortly after their reunion. Another case poignantly brought home the flu’s cruel irony. Airman Alan McLeod of Stonewall, Manitoba became at 18, Canada’s youngest Victoria Cross winner. Days after returning to his home town, this young hero, who had shot down three enemy planes and survived a burning plane crash, did not survive the silent killer. In 1918 almost everyone was nursed at home. People helped their neighbours in whatever way they could. Women volunteered as nurses. Service club members cooked meals in church kitchens and boy scouts delivered the meals. In Ontario the thousands of women volunteers became known as the Sisters of Service. Throughout the country Christmas dinner celebrations were held to thank the volunteers. But there was a sour side too. In Calgary some women posed as private nurses charging as much as $25 per day, while real nurses worked two shifts for only $2. Meanwhile, druggists in Vancouver boosted the price of camphor used as a disinfectant from 60 cents pound to $6.50. Masks sold for a nickel. Preventive measures included bags of camphor, or garlic. At Toronto’s Union Station, tin drinking cups were replaced by disposable paper ones. Cinnamon, tobacco, alcohol and goose grease and turpentine mixtures were touted as cures. And where did it start? I remains unclear. The Spanish flu is thought to have originated in burning pile of manure at Fort Riley Kansas in March 1918. American troops got sick, subsequently taking it to Europe. It got tagged the Spanish flu because Spain was first to get hit hard and without censorship, the first country to admit it had an epidemic. By the time it was over, influenza had killed 20-30M worldwide. But its cause remained a mystery. In 1933 a British doctor successfully isolated the disease to an airborne virus. Later it was identified as the A type strain. Today the story of the world’s greatest killer is all but forgotten. There is little mention in history books. It’s as if it never happened. But could it happen again? And if it does, are we ready for it? Do we really have an effective vaccine today? And can we develop it quickly enough when needed? The Fort Garry area which was incorporated as a municipality on April 16, 1912 and the Wildewood area is one of its distinctive residential areas. Fort Garry was initially part of St. Vital and was settled by Metis and Quebecois farmers. These early settlers were Metis boatmen who build their homes close to the river’s edge as it was their best choice in transportation. One of the most famous landowners in the area that later became Wildewood was Ambroise Lepine. But after the Riel incident, many French people left the area and were replaced by Anglophones. Over the years it has completely lost its French origins. Only in the south end at St. Norbert will you see what the early Fort Garry was like. But by 1900 virtually all traces of the Metis heritage of the area was gone. One developer after another tried to develop the land starting with Colonel RM Thompson who in 1908 first introduced the name Wildewood. Thompson’s plan was for a very exclusive area just like was developing then on Wellington Cres. They built roads and Col Thompson had a huge Victorian mansion built at the point of the Red River. Col Thompson went to fight in WW1 and never returned. His house was not fully completed and was not occupied for 17 years and was to be demolished in 1933 after suffering years of vandalism. Finally in 1934, it was bought by Ravenscourt School and renovated to become a boy’s school. But the land continued to bounce back and forth between the City of Winnipeg and the Fort Garry municipality. 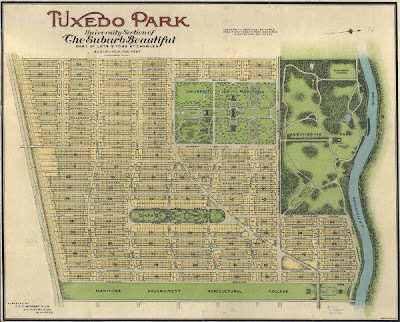 At one time during the 1930s the city was contemplating making it into a park just like Assiniboine Park. But lack of money saw the city give it back to Fort Garry. Then construction began using assembly line techniques after materials had been procured en masse and brought to the site. Lumber had even been salvaged from grain bins. Panel forms were used for pouring basements, and the exterior walls were prefabed. Specialty crews worked on flooring, shingling, and insulation. A US newspaper featured a bungalow and a storey and a half built in just 58 minutes. The realty firm SS Stevensen handled the sales, and it took only 2 years to sell out. Mature trees were spared preserving the area’s main amenity: its heavily wooded quality. The neighbourhood had to do their own snow removal buy hiring a man and buying a horse drawn plough. Cost per resident was $.50 annually. They also bought their own mosquito fogger. It has only happened once in Winnipeg’s history, a Police Strike, and when it happened 81 years ago June 9, during the six week 1919 general strike, it resulted in the firing of all but 23 members of the police and major changes in the careers of two police chiefs. Despite warnings by the Police Commission in 1917, Winnipeg policemen had formed their own union in July 1918. At a meeting of the trades and labour Council the newly formed union voted in support of the general Strike. Yet they stayed on the job at the request of the strike committee. In effect it replaced the city as their control. 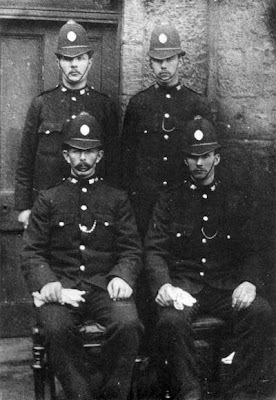 It is thought the policemen having just returned from WW1, where they fought side by side with workers were sympathetic to the aims of the workers. On May 19 Mayor Charles Gray, asked the policemen to sign an agreement not to participate in a sympathy strike. Two hundred and twenty-eight refused and on June 9 all but the 23 who signed loyalty oaths were dismissed from the force. To keep order, a special police force was set up under Major Lyall with members of the Army and the North West Mounted Police. Three thousand “specials’ were hired. On June 11, Chief McPherson took the fall for the policemen’s actions and was dismissed. McPherson had been chief from 1911 and a cop since 1903. McPherson had a good record and had been prominent in the successful firebug investigations of 1913. Deputy Chief Chris Newton who had been one of the 23 to sign the loyalty oath replaced the disgraced Chief MacPherson who was never given a satisfactory answer for his dismissal. Hugh John Macdonald a member of the Police Commission fought against MacPherson’s dismissal. A year later MacPherson was still fighting for compensation and finally received $5,000, a year’s salary and a letter of recommendation. On June 21 the strike got ugly as two strikers were killed by Mounted Specials. By June 26 the strike was over and on June 27 the original policemen began to return to their jobs. Newton noted that 39 men several of whom had been active in the union should not be allowed to return to the force. Those that had stayed on during the strike received bonuses. Chief Newton helped build morale within the dept. He helped organize the Winnipeg City Police Athletic Assoc and later the Police Pipe Band. Twenty five years later, at age 63 after a distinguished 33 year career, Newton would face his own crisis of confidence. It started with a fight after a traffic incident at the corner of Broadway and Balmoral St. In June 27 1934 300 pound Winnipeg Police Chief Christopher H Neuton was charged with beating up 145 pound Joe Erlicky closing his eyes shut. The Free Press showed the diminutive Erlicky with his eye closed shut. Neuton had the class to resign. After a circus of a trial Neuton was found guilty of common assault and had to pay a $20 fine. Transcaona was built because of the railway shops. And on April 6, 1912 Transcona received its charter. It had been a heady period for businessmen that had enjoyed visions of a second Chicago. Transcona is named for the Transcontinental Railway (TRANS) and (CONA) for Lord Strathcona. It was one of the few places in Manitoba that does not owe its origins to agriculture but to the railway. In 1907 800 acres were acquired for the railway shops. It was soon discovered to be a swamp, part of a natural watercourse running from the Tache municipality to the Red River. As the shops were being built, 4 feet of fill were used to elevate the entire facility. The original town located south of the shops was largely abandoned and a new town was built north for the shops. The boom was on. Land that had been selling for 100 per lot was now selling for $100 per front foot. The boom did not last. But hard time in the when rail business was low due to the end of the immigration of settlers to the west and low grain prices. In 1920 Transcona had to face hard facts. Dreams of their future had been unrealistic. When it came time for city council to pay for services it found it had $285,00 in expenditures but only $4,485 in revenues. The town’s affairs were taken over by the province till 1927 when it began to run its own affairs. Till Regent Ave was paved in July 1931, under a depression works program, most Transcona residents would go to the city, Winnipeg, by train. On Sept 1, 1947, the country’s worst train wreck happened as a train of vacationers returned form Minaki ran into a transcontinental train at the Dugald station a few minutes east of Transcona. It killed 35.